Looking back, Jonathan Butler marvels that he became an international star in jazz, R&B and gospel music who has endured for more than 30 years. Butler’s rise in South Africa came in the late 1970s and 80s, when that nation’s racist apartheid system of government was approaching its end. But like America’s Jim Crow racial caste system on which South African apartheid was modeled, the minders of the racist status quo became more reactionary and thus more dangerous to young men like Butler as the ultimately successful effort to dismantle apartheid gained momentum. However, it is difficult if not impossible to keep Butler’s talent under wraps – even in a place as oppressive as apartheid era South Africa. 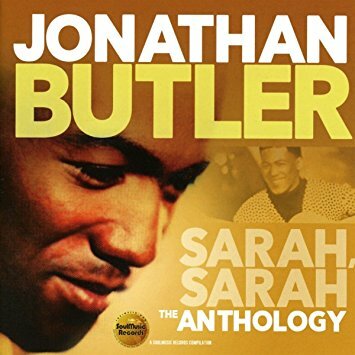 Butler’s talent was apparent well before the 32 songs featured on Sarah, Sarah: The Anthology – the latest in the Soul Music Records series of anthologies – reached radios in the United States. Butler was performing in choirs and other musical groups at a young age and was a polished performer who recorded hit cover versions of 1960s era American pop and soul songs for South African radio. Butler’s talent earned him a record deal and enabled his songs to cross over in South Africa at a time when apartheid sought to rigidly maintain the segregation of music. Butler then became a vocalist for the South African jazz/funk group Pacific Express, and this connection led to a deepening appreciation of jazz that would benefit Butler when he broke through internationally in the late 1980s. Butler was fortunate to connect with people who were interested in promoting his development as musician and songwriter as well as a vocalist. When Butler’s 1987 album, which served as his American debut, dropped, he was a refined instrumentalist, vocalist and songwriter. How refined? A lot of people thought they were hearing George Benson when they heard the guitar playing on “Lies,” the lead single from Jonathan Butler. Fans of that album will enjoy Sarah, Sarah, because the anthology includes more than half of the tunes from that album, including an extended version of “Lies.” Sarah, Sarah is weighed heavily toward Butler’s output as a R&B singer and jazz instrumentalist with Jive Records from 1985 through the late 80s and early 90s, including six tracks from his1985 solo debut such as “Crossroads Revisited,” “7th Avenue South” and “Song for Jon,” which display Butler’s melodic guitar playing and his creativity as a soloist. Butler also began to record gospel music about 20 years, ago and he has released several highly regarded albums. Sarah, Sarah: The Anthology serves as a reminder that Butler should be included in any discussion of 1980s era love singers. Strongly Recommended.